Belgrade, however it is not stipulated in the Constitution. Following the death of President Tito (Josip Broz), who had made efforts in maintaining the federal system of the country, the Federal Republic of Yugoslavia was faced with the transition from communism to democracy as well as a market economy. Such dramatic change in the political and economic systems triggered a sudden social instability. As a result of this instability, there was a rapid emergence of politicians in each republic who wished to increase their own power by utilizing nationalism, which consequently led to the eruption of conflict. People who had been living in peace with one another were forced into a situation where they had no choice but to fight with those who had long been their neighbors. It is said that 2,000,000 people were forced from their homes to became refugees or IDPs (Internally Displaced Peoples), losing everything, and left with many traumas. 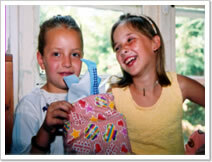 In 1994, when JEN began its activities in the former Yugoslavia, the conflict in Bosnia Herzegovina was still raging, and there were many refugees in both Croatia and Serbia Montenegro. Holding fears that they “would not be able to return home” in their protracting lives as refugees, the refugees were in need of psychological care and assistance for self support. 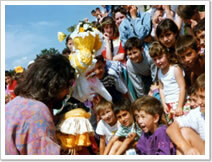 After the peace accord that was signed in December 1995, many refugees and IDPs began to resettle in Bosnia. Needs to rebuild people's lives therefore were high, as well as promote the return of minorities. 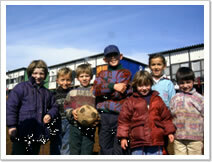 In 1998, with the intensification of the Kosovo conflict, new refugees and IDPs emerged. This was only exacerbated with the NATO bombings, as more and more people newly became refugees or IDPs in areas where aid was seldom. Even after the latter half of 1999, when the conflict had finally died down, problems remained in abundance: the reestablishment and reconstruction of a land completely destroyed, the resettlement of returnees, and the settling in of refugees in their respective host countries. By simultaneously opening 5 offices throughout Yugoslavia, we were careful from the initial stages to provide support fairly and from a neutral position. When commencing activities in Bosnia Herzegovina, we did so with bases in both entities (the Federation of Bosnia and Herzegovina, and the Republica Srpska). We did not limit our support to refugees and IDPs, rather expanded it to “those who were forced to live harsh lives” as a result of the conflict, which included locals who had received the refugees, as well as people who had chosen to remain in the lands of conflict. 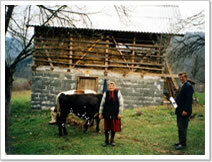 In various places throughout the former Yugoslavia, we provided support that was most suited and needed in each area at the time. The JEN international staff mainly only coordinated, while we chose local psychologists, social workers, architects, vets, and technicians to carry out the projects. 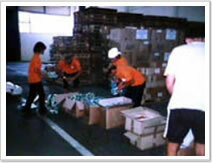 We were therefore able to conduct a wide range of activities. Refugees who do not know if they can ever return to their homes. Returnees who are faced with the harsh reality of rebuilding their lives from scratch. It takes time to overcome the loss of family and possessions from conflict alone; these people were faced with much, much more. Targeting such people carrying various anxieties and sorrows, we conducted group therapy workshops aimed at psychological care. People from a wide range of age groups attended, and engaged in activities that had the highest number of requests from each community center; for example, knitting, sports, and painting, among others. For those who had stayed locked up inside their homes, the first step is the biggest, and also the most difficult. One aim of these activities was to provide a few moments in the people's lives when they could forget their sorrows. 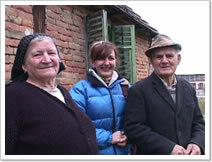 They were able to support each other and share their troubles, as well as information about daily life and repatriation with others who had gone through much like themselves. 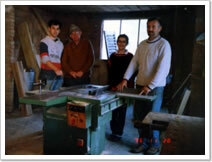 This was one of the first projects we started in 1994. With the help of a local children's theatre in Osijek, we were able to hold many performances at local refugee/IDP centers, NGO community centers, as well as the children's theatre itself. The parody version of “Little Red Riding Hood” was a great hit among the children, and was able to provide a moment when they could forget the difficult reality of their lives as refugees. Families from all over Japan filled their handmade pouches with toys and stationery, and delivered their “dream bags” to the people in faraway Yugoslavia. 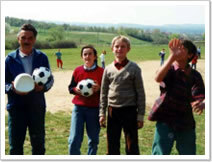 The “dream bag deliverers” went to homes in Yugoslavia to hand the people the bags themselves, while at the same time spent time singing and dancing and playing sports with the children. The city of Vukovar, located just across the Croatia-Serbia border, was a city of rubble from the heavy fighting that had gone on during the war. From 1994, JEN began medical support as the only NGO in the area, where, due to political reasons, no public medical system existed. In a place where all nearby medical facilities had been destructed, support in the shape of pharmacies was essential to people who needed medication on a daily basis. 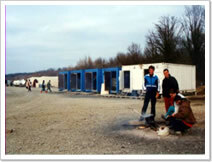 In 1995, inside UN administered territory along the Croatia-Bosnia border, we managed a transit camp that accommodated Bosnian refugees in cooperation with UNHCR. JEN was the only NGO working in the area at the time. We took on many tasks within the camp, which housed more than 600 refugees, including distribution of food and sanitary goods, repairing of toilets and showers, setting up tents, and managing clinics, among others. 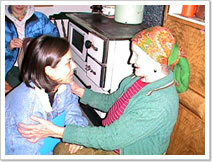 Visiting Homes of Elderly Refugees, Protection of Children, Provision of Furniture and Heating Appliances at Nursing Homes, Provision of Minibuses for Facilities for the Disabled, Support for the Deaf-Mute, Support for Facilities for the Blind and the Mentally Disabled, Acceptance/Home Visiting of Orphans on Weekends, Orphanage Support. In Slavonski Brod, a town along the Croatia-Bosnia border, we made several visits with doctors and social workers to homes of elderly Bosnian refugees. We continued our support until 2004, when the last of our initial 300 people receiving our support **was able to return to Bosnia/sadly passed away**. Although quite a number of refugees were able to return to their native Bosnia, many, unfortunately, passed away in a foreign land, far away from their homes. In 1996, a year after the Dayton Accords were signed and when the two entities still remained largely divided, it was not easy for people to go to and fro to visit their homes. During such times of difficulty, we organized art exhibitions and various computer courses, through which people were able to go, albeit temporarily, back to their native lands. 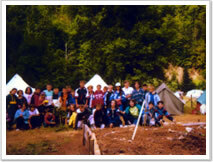 From 1997, we hosted summer camps and sports events in which people from different ethnicities participated together. Amidst the slow but steady flow of repatriation, we conducted programs aimed at generating income, while simultaneously having a peacebuilding/ethnic harmony focus. 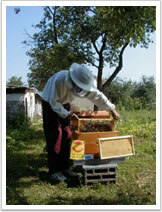 People from different ethnicities participated in training sessions together, and once completed their training, were given materials (such as beehives) needed to launch the beekeeping project. 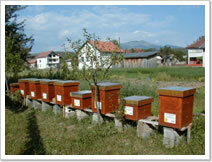 The Beekeeping Association that was established by the participants themselves managed the shared materials, so that such collaborative work may continue following the completion of the project. 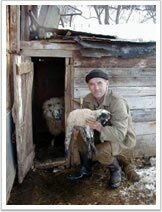 In order to accelerate repatriation and resettlement in Sipovo, a place that experienced heavy fighting and destruction during the war due to its location between the two entities, we distributed various livestock as a means for generating income. 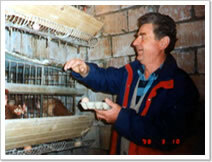 Livestock was chosen to be distributed, as the local people already had knowledge and skills from before the war. 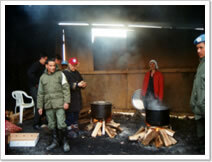 Goats, sheep, cattle or pigs were distributed depending on each person's needs. In order for the refugees to lead self-supported lives while making full use of their skills and experienc es at the same time, we made small scale loans with no-interest in accordance with each person's needs. From carpentry to auto repairing, beekeeping, poultry farming and monumental masonry, people began working once again, and their joy in being able to support themselves and their family was beyond words. 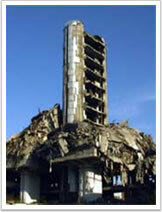 The many Albanians that returned to their homes after the NATO bombings, found their native land completely destroyed. With the harsh Kosovo winter approaching, where temperatures fall under 0 in October accompanied by heavy snowfall, there was deep concern over how people who had lost their homes would be able to survive through it. 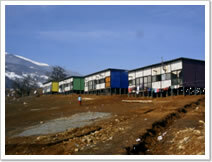 Given the circumstances, we set up 200 temporary housings that were used in the Kobe earthquake around Deçani/Dečani , an area in northwestern Kosovo that had suffered particularly serious destruction. 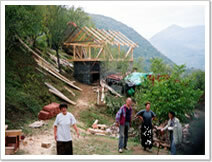 The returnees were able to pass the winter in these housings while repairing their homes. 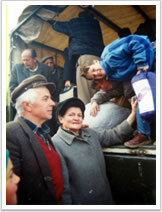 We distributed sanitary goods to IDPs that had fled Kosovo to Montenegro. While aid flooded into neighboring Macedonia and Albania, where many refugees had fled, few organizations had provided relief aid in Montenegro. Another difference in our approach to relief provision was in the way we obtained our materials; we chose to purchase our relief goods within Serbia and Montenegro rather than in Europe or the US, as most international organizations had done. In this way not only were we able to provide speedy relief, but also generate positive economic effects in the local community that had been struggling financially from accepting many IDPs. We provided support for occupational training scholarships for refugees who had already secured employment in the area which they had fled. For example, we financially supported people to obtain bus driving licenses, which had high demand at the time. Langues le croate (officielle), le serbe, etc. Religions Orthodoxe Serbe, Islam, Catholique, etc. Religions Orthodoxe, Islam, Catholique, etc. Après le décès du Président Josip Broz Tito qui s’était efforcé de maintenir le système fédéral du pays, la République Fédérale de Yougoslavie c est petit à petit démantelé. Avides de popularité, les politiciens des républiques de l’ancienne fédération se livraient à des discours politiques à caractère nationaliste. Ce qui activa les tensions et l’éruption des conflits. En 1994, JEN ayant été témoin de la violence en Bosnie-Herzégovine et du déplacement massif vers la Croatie, la Serbie et le Monténégro, a commencé ses opérations. Les réfugiés, cédant au découragements répétés et la peur de ne plus jamais retourner chez eux, nécessitaient des traitements psychologiques pour leur équilibre et leur remise en confiance. Suite à l’Accord de Paix de Dayton signé en décembre 1995, de nombreux réfugiés sont retournés en Bosnie-Herzégovine. En 1998, on assista à une nouvelle vague de réfugiés et PDI avec l’intensification des conflits au Kosovo. Le bombardement de l’OTAN ayant provoqué l’afflux massif des populations vers des zones qui n’étaient pas couvertes par l’assistance humanitaire. Malgré le cessez-le-feu à la seconde moitié de l’année 1999, les problèmes n’ont connu aucune amélioration. Il fallait procéder à la reconstruction des terres qui étaient complètement ravagées, à la réhabilitation sociale des rapatriés, ainsi qu’à la réintégration des réfugiés dans un pays d’asile. Depuis l’ouverture simultanée de cinq de nos bureaux dans quatre pays de l’ex-fédération yougoslave, notre principe consistait à porter assistance de manière équitable et neutre. Nos activités en Bosnie-Herzégovine se fondaient sur ce principe, sans aucune discrimination entre les deux entités opposantes que sont la Fédération de Bosnie-Herzégovine et la République Srpska des Serbes. Nous avons porté l’assistance souhaitée, de manière appropriée et flexible en fonction de la variation des situations sur le terrain. Le personnel international de JEN était limité à un coordinateur et des employés locaux qui étaient les réalisateurs des projets. Ces derniers comprennaient des experts locaux, tels que des psychologues, des assistants sociaux, des architectes, des vétérinaires et des ingénieurs. En donnant la priorité aux populations sensibles, JEN a organisé des ateliers collectifs pour le traitement psychosocial. Les participants étaient de plusieurs tranches d’âge. Ils s’engagent dans les activités souhaitées par la majorité des participants de chaque atelier (le tricotage, le sport et la peinture). Pour ceux qui étaient renfermés sur eux-mêmes dans leurs maisons, le premier pas a été le plus lourd et le plus important aussi. Un des objectifs des ateliers est de leur fournir des moments où ils puissent noyer leurs chagrins avec d’autres participants, pour qu’ils puissent se soutenir entre eux à travers le partage de leurs expériences, de leurs problèmes et de leur quotidien. Notre premier projet a été lancé en 1994. Nous avons donné de nombreux spectacles avec le Théâtre des Enfants d’Osijek dans les communautés locales ; dans les centres d’accueil de réfugiés et PDI, dans les salles de réunion des ONG, ainsi que dans le Théâtre des Enfants. La pièce parodiée du « Petit Chaperon Rouge » a été un triomphe pour les enfants. Ils pouvaient ainsi partager avec des spectateurs des moments de joie les amenant à oublier les vicissitudes de la situation de réfugiés. La ville de Vukovar située à la frontière serbo-croate a été le théâtre d’une bataille sanglante pendant la guerre. Depuis 1994, JEN s’est établi comme l’unique ONG présente dans la région et a entamé le soutien médical. Pour des raisons politiques, la ville n’avait aucun système de santé public. Dans les zones où les installations médicales ont été complètement détruites, le soutien pharmaceutique était essentiel pour ceux qui avaient besoin de la médication quotidienne. En 1995, sur la base d’un accord avec le HCR, JEN a géré deux des camps de transit pour les réfugiés venus de la Bosnie-Herzégovine et qui transitaient par la zone de sécurité de la FORPRONU (hors des autorités municipales) au long de la frontière entre la Bosnie et la Croatie. JEN a été la seule ONG à avoir administré les deux camps. Nous avons accompli de nombreuses tâches dans le camp de 600 personnes à savoir distribuer les biens de première nécessité, restaurer les système sanitaires, construire des tentes, administrer des cliniques entre autres. Visite aux réfugiés âgés, protection des enfants, installation des meubles et des chauffages dans les maisons de retraite, don des minibus aux établissements des handicapés, soutien pour les sourds-muets, les aveugles, les handicapés intellectuels ainsi que les orphelinats, visite aux familles qui accueillent chaque weekend des orphelins. Dans une ville de Slovanski Brod le long de la frontière entre la Bosnie et la Croatie, nous avons soutenu des visites de médecins et d’assistants sociaux aux réfugiés bosniaques en Croatie. Le nombre de population cible de nos projets a été initialement 300 ; nous avons poursuivi notre soutien jusqu’à la fin du traitement des derniers personnes cibles en 2004. Un certain nombre de réfugiés ont été rapatriés en Bosnie, mais la plupart sont malheureusement décédés en Croatie sans revoir leur pays natal. En 1996, un an après la signature de l’Accord de Dayton, il était encore difficile pour les réfugiés de repartir chez eux car la tension était encore vive entre les deux protagonistes. Pendant cette époque dure, nous leur avons organisé de nombreuses visites temporaires dans leur pays natal à travers des expositions d’objets d’art et des cours d’informatique. Nous avons également réalisé depuis 1997 des camps d’été et des réunions sportives auxquelles ont pris part les deux parties. Au fur et à mesure que le rapatriement suivait lentement son cours, nous avons initié des programmes visant la création de revenus en marge de l’éducation sur les valeurs de paix et d’harmonie entre ethnies. Les participants issus des deux camps rivaux ont suivi ensemble des formations en apiculture et ont ensuite reçu du matériel nécessaire tels que les ruches. Une Association d’Apiculture a été fondée par les participants pour une bonne gestion du matériel commun jusqu’à l’aboutissement des projets. La ville de Sipovo, coincée entre deux entités rivales, a été le théâtre de violence et de destruction sauvage pendant la guerre. Afin d’accélérer le rapatriement et la réintégration au sein de la ville, nous avons distribué du bétail en vue de la création de revenus. La nature du bétail varie en fonction des besoins des populations locales : chèvres, moutons ou cochons. Afin d’encourager les réfugiés à travailler indépendamment et en même temps maximiser leurs capacités, nous avons prêté sans intérêt de petite somme d’argent selon les besoins de l’emprunteur. Grâce à nos projets les emprunteurs ont repris leurs métiers de chantiers, de réparateurs des autos, d’apiculteurs, d’aviculteurs et de maçonnerie. Ils ont retrouvé de manière inexprimable, la joie vivre et de travailler. Nous avons offert des bourses pour la formation professionnelle des réfugiés qui avaient déjà retrouvé un emploi dans un domaine où ils exerçaient leur métier avant la guerre. Par exemple, nous avons offert de l’assistance financière l’apprentissage de la conduite des autobus et l’obtention du permis de conduire dont la demande était forte à cette époque-là. Les Albanais retournés après le bombardement de l’OTAN ont retrouvé leurs terrains complètement détruits. Il y avait un souci majeur à savoir les sans-abri provoqués par le du bombardement ne pourraient pas survivre pendant l’hiver dur où les températures étaient en dessous de zéro degré qui s’annonçait au Kosovo. Dans de telles situations, nous avons emprunté 200 logements temporaires utilisés lors du violent tremblement de terre à Kobe au Japon en 1995, que nous avons mis à la disposition du village de Deçani au nord-ouest du Kosovo. Les rapatriés ont ainsi passé l’hiver dans ces abris à côté des chantiers de reconstruction de leurs propres maisons. Nous avons distribué les articles sanitaires aux PDI qui se sont réfugiées au Kosovo et au Monténégro.